This one was probably a bit borderline in terms of appropriate content for a sitcom, but come on, "Oboy oboy"?! If you don't laugh at that you're dead inside. Rick will get a custom black and white illustration of whatever he likes (within reason). Girl: Erwin, are you sure the “Blueberry Pie Avenger” is the best super hero theme you can come up with? Off-panel: These are the ONLY powers the mutant pie gave me! On screen: Oh god! I put the roast to bed and the baby in the oven! Off screen: LUCY! You got some ’splainin to do!!! Thanks to everyone who entered! I'll be posting Caption Contest 16 in a moment, so stay tuned for your chance to win. 5 Responses to Caption Contest 15 Winner! I thought it was borderline but really, he could be doing anything right? Right. Rick, you totally seserved to win. I literally laughed out loud at this one. Something about “oboy” as opposed to “Oh boy” really got me. This was absolutely halarious. Great job man. I am sad to say that I listened to how he said it and decided to shorten it up. It just looked funnier to me. You know, that’s one of the interesting things about comics as a medium, how the word looks both in terms of how it’s spelled and how it’s drawn, greatly affects its impact whether you’re playing it for humor or drama. You’re both right, “oboy” is much funnier than “Oh boy”, a distinction that’s pretty much lost in a movie but huge in a comic. I was also thinking about the “dude” commercials. Same spelling but the way it is vocalized evokes different meaning. 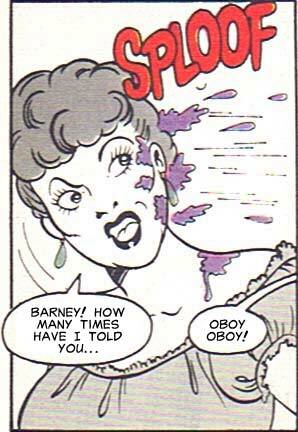 In this case, the “oh boy” does not necessarily sound (to me) like what Barney actually sounds like which is the quicker “oboy”.